33% of Dutch businesses with 50 or more employees on site indicate that they use a solution for Unified Communications, i.e. pretty much at the same level as a year earlier, but somewhat higher than 2 years ago. We were previously used to clear annual growth figures. In 2013, 17% of the sites had Unified Communications. In brief, the number of users of Unified Communications had doubled in the last four years. The biggest driving force behind the growth of these figures concerns the increased use of Skype for Business application: 27% of the interviewed locations have a Skype for Business application at this time. Here once again we see that the strongest growth seems to be a thing of the past, as only one percentage point has been added since last year. This is shown by an analysis by Smart Profile based on interviews with more than 6,000 Dutch commercial and public sites in the last 12 months. Whereas Lync used to be a separate server solution, Skype for Business can also be obtained alongside a(n) (on premise) server version via the Office 365 licence. A part of the dissemination of Skype for Business is linked to the increased use of O365. It is not always clear whether and to what extent the possibilities of Unified Communications within the O365 licence are used. For instance, one company can use the possibilities of Skype for Business by using videoconferencing, share files and replace the telephone exchange with the Skype for Business Server, while another uses only the messaging function of Skype for Business. 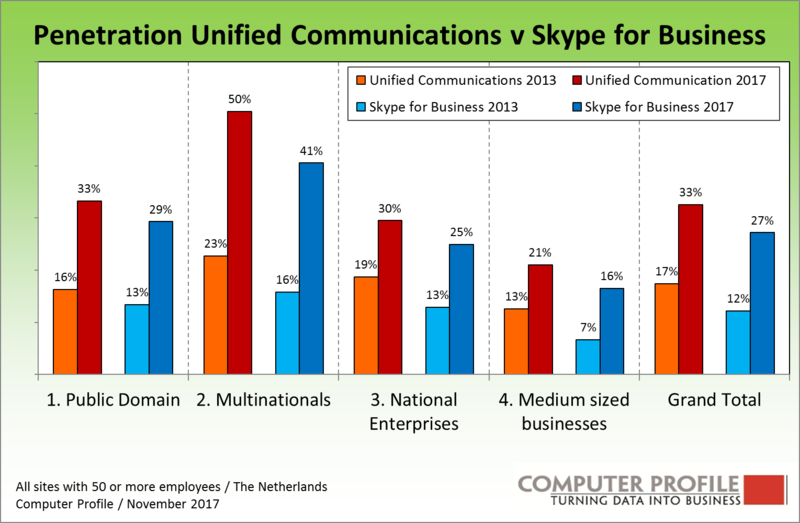 Sectors where the use of Unified Communication is above average are: ICT & Utilities where the use of UC is 48% and of Skype for Business 38%, the government sector where 40% indicate that they use UC and 34% that they use Skype for Business, and sites in the education segment with a UC penetration of 38% and Skype penetration of 36%. A precondition for Unified Communications is the availability of IP lines (for communication). VoIP is usually the first feature used. The use of VoIP among the interviewed Dutch sites currently stands at 63%. Four years ago that was ca. 61% and in 2009, it was less than a third of the sites. We can see clearly the consolidations that have taken place in the last 10 years in the public sector VoIP. This concerns ca. three quarters of the sites in ICT & Utilities. Construction, industry and healthcare are segments that score relatively low. Nearly 55% in this sector indicated that they use VoIP. When the use of VoIP is considered in relation to the size of the company, 58% of the sites with 50 to 100 employees use VoIP; 61% of the sites with 100 to 200 employees; 67% of the sites with 200 to 500 employees; ca. 70 % of the sites with 500 – 1000 employees, and 76% of the sites with more than 1000 employees. When the vendors of solutions for VoIP and Unified Communications are considered, we see that Cisco is the most prevalent party. About 17% the solutions encountered on the two aforementioned segments involve a Cisco application. We leave the use of Microsoft Skype for Business (and its precursors) out of consideration. Cisco registers its largest share in sites of Multinationals. Nearly half of the VoIP/UP solutions in that segment involve a Cisco application. Mitel accounts for 16% of IP solutions overall. The Canadian company registers its highest share (28%) in sites in the public sector (government, education and healthcare). Avaya (number 3) has a 13% share, with its highest share in sites of Multinationals. KPN has nearly as large a share (13%), but is not a manufacturer, only a reseller/integrator of IP solutions. The underlying hardware and software will usually stem from the other vendors on the list. The top 5 are rounded off by VodafoneZiggo. They score relatively high in sites of Multinationals (Vodafone label) and Medium Sized Businesses (Ziggo label). Videoconferencing solutions can be part of a solution of Unified Communications as a standard, albeit not by definition. That is why the target group (Dutch sites with 50 or more employees) were interviewed separately about the use of videoconferencing solutions. 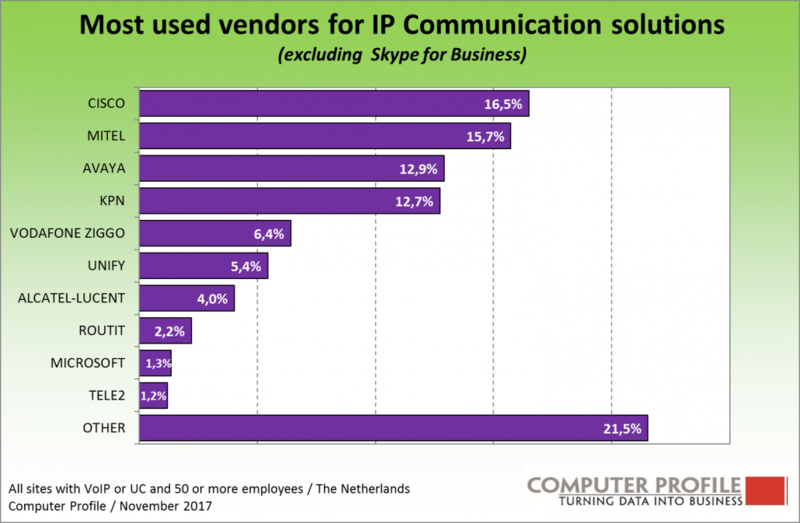 Cisco is the most prevalent application for videoconferencing among Dutch sites with a 40% share, including the Tandberg share, which accounts for about half of all Cisco videoconferencing solutions. In 2016, Mitel attempted to take over Polycom, but this attempt ultimately failed when the investment company Siris Capital made off with the prize. 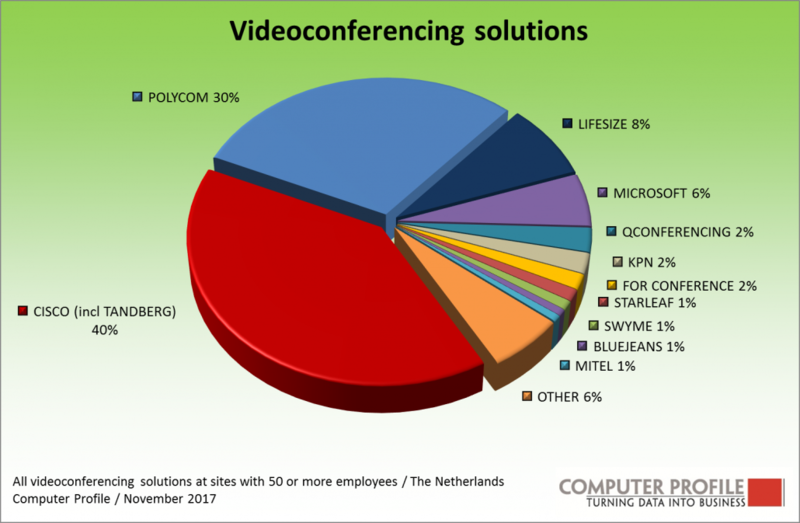 Polycom accounts for nearly one third of all videoconferencing solutions encountered in Dutch sites. Cisco is the second largest vendor in this field, with more than one third of the videoconferencing solutions. Lifesize, now independent from Logitec, ranks number three, with an 8% share. The use of videoconferencing solutions is on the wane. We see a declining penetration for videoconferencing solutions as of 2013, when 21% of the sites indicated that they used such a solution. That figure is now 12%. Online videoconferencing possibilities have increased in recent years, lowering the threshold for videoconferencing. The use of classic videoconferencing solutions at the boardroom level will persist for some time still, but the levels below it will switch more frequently over to online tools which, with a built-in or loose webcam, will constitute a cheap alternative.